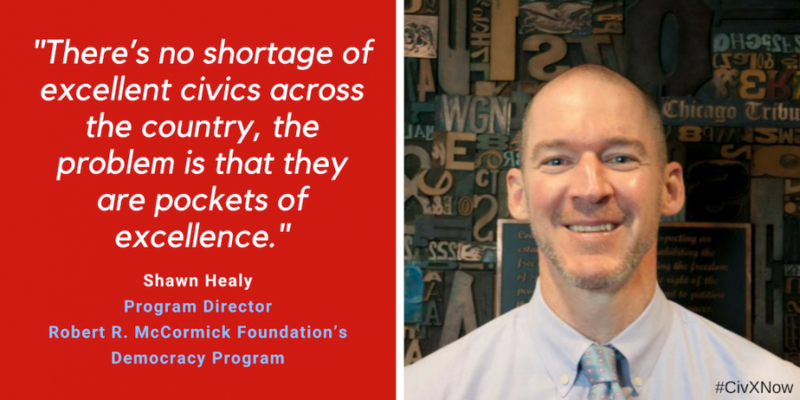 Over the past decade and a half, Shawn Healy, the program director for the Robert R. McCormick Foundation’s Democracy Program , has led the effort to persuade the Illinois State Legislature to pass one of the country’s most sweeping civic education reform laws. As the Chair of the Illinois Task Force on Civic Education, he built a multi-system, statewide coalition and public advocacy movement that led to the passage of the law, which requires that all Illinois high school students, starting in 2016, complete a stand-alone, semester-long civics course. Before joining the McCormick Foundation, he served as a social studies teacher at West Chicago Community High School and Sheboygan North High School. Q: What did the Taskforce push for in Illinois? Healy: The task force made six recommendations. The primary one was a civics course for high school and an update to the standards. We also got into project based learning, professional development for teachers, integrating civics best practices, and then engaging students around elections. It was an arduous process. But with a strong bipartisan the legislation passed in May 2015, the governor signed it in August, and it took effect in the 2016 school year. It meant that every student had to pass a civics course before graduating in 2020. Q: What’s next in Illinois? Healy: We have spent the last three years deeply immersed in implementing these policies. And we are now turning our attention to pushing for some policies that drive civic education to the lower grades. So, we’re not done yet. Q: What made this process so arduous? Healy: The reality was that if we were going to do this and require something new, we had to find a way through private sources to pay for implementation. Other states like Florida and Massachusetts have provided appropriations for implementation. That was a non-starter here. So we had to raise private dollars so we were going into our advocacy process saying that if you support this policy we have private dollars to support implementation. Even with that there was some skepticism and some concerns about placing another mandate on schools… It was difficult just the persuading, and building the implementation plan before the law was passed. Q: How difficult was it to get private funding involved? Healy: It wasn’t too difficult. Part of it was that I have the privilege of working for a foundation that already funds extensively in this area. So, we had to put more dollars in. We already spend over $1 million per year in funding teacher professional development in civics. But we agreed to put more in on top of that, while also maintaining our existing commitment. And then we went to the other major foundations in Chicago and got similar commitments, not at the $1 million level, but at the hundred thousand to a couple of hundred-thousand-dollar level. And then a couple of corporate funders -- Allstate and Boeing. Collectively we were able to raise more than $1 million on an annual basis, on top of our existing commitments to civic education, to support implementation. Q: Talk about the role that partnerships played in this process. Healy: We had to build partnerships to host PD events across the state. Those were mostly universities and also regional offices of education for partnerships. We had to find a way of mobilizing Chicago-based civic education organizations to work state-wide. And then ultimately we recruited a cadre of veteran teachers we call Illinois Civic Teacher Mentors that literally represent every regional office in the state. We have 38 of them outside of Chicago. We recruited teachers from every office and provided them with extensive training. They are our boots on the ground in every corner of the state. They are our connective tissue throughout the school year. It has been a four-pronged approach: Funding, the institutional partners, civics education partners and our teacher mentors. Q: What are the universal takeaways from Illinois? Healy: We are not the only state that has had success. I learned a ton from what they did in Florida. I think having an institutional center for this work -- in the case of Florida it was a university -- is integral. For us, it has been my foundation. And having some type of financial resources associated with that institution is also important. In my case we have an endowment. In Florida’s case, they had state appropriations. That seems critical. You definitely need someone who can devote a significant amount of their work time to this effort. For a good part of this battle, this was a lot of what I did on a daily basis. This can’t just be a sometime thing. You have to literally have a staff person that devotes a lot of their time to coalition building and advocacy. This is something that -- as I look at our state and Florida and California -- is probably a five- to ten-year effort. You start small and you build. We built that coalition, and we built a network of schools throughout the state. That was important in its own right, but that became the base for our policy push. Q: So should we expect a decade-long process in every state? Healy: Maybe this can happen at a more rapid pace because of what we’ve learned in states like Illinois, Florida and Massachusetts. We are certainly in a moment. I am a funder. I am in weekly calls now with other funders who are interested in this area. Q: How difficult is the funding part of this? Healy: There are a lot of funders in education and a lot of funders in democracy, but very few fund where they intersect. A lot of the education funding is focused on STEM or basic literacy, and the democracy funding is largely focused on institutional reforms and campaign finance or redistricting. To me it’s about wedding those funding streams. We need to make a better case with both groups. Q: How big a problem is inequity in civics? Healy: There’s no shortage of excellent civics across the country, the problem is that they are pockets of excellence. It’s not the norm everywhere. And then there are huge inequities in inputs. I’ve looked at best practices in civics, and what I found is the most effective practice is students discussing current events in class. Students do best when they discuss current events every day. That’s the best dosage. When you look at the data, white and Asian kids have the best dosage, while black and Latinx students do not. Q: Why is the CivXNow Coalition important to you and important to McCormick? Healy: Because of our investment in civics over a long course of time, it is our duty. It’s a passion of ours and something that is core to our work. We’ve learned a lot of hard lessons that we are eager to share. People look to us because of the investments that we’ve made. So that is kind of the duty side of this. The carrot side of this is, selfishly, we want other funders to enter this space. We don’t want to carry this burden ourselves. We’d love others to be there. We are eager to learn from other states. We’re eager to learn from national efforts. And most importantly, I really believe in Louise. I really believe in iCivics. I really believe in the steering committee and the folks who are joining the Coalition. And to me, this is the most promising development I have seen in my time in this field. And that is a couple of decades now. I really believe in the folks at this table -- that we are poised to take advantage of this moment in time. And it seems like there is a genuine moment here to make progress nationally, in the states and districts, and I think the combination of players have a lot of promise. Share some of your favorite insights from Shawn (@IllinoisCivics) on Twitter using the hashtag #CivXNow! Join the coalition or take the #CivXNow pledge here.